Videos and lessons with examples and solutions to help High School students learn how to compute (using technology) and interpret the correlation coefficient of a linear fit. 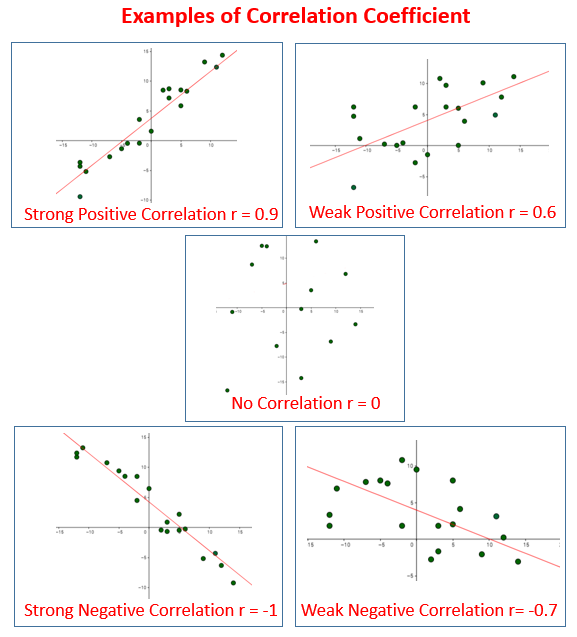 The following figures show examples of graphs with strong positive correlation, weak positive correlation, no correlation, strong negative correlation, weak negative correlation and their correlation coefficient. Scroll down the page for examples and solutions. This video will show how to interpret the meaning of the correlation coefficient when a data set is described by a line of best fit. A short tutorial on calculating a correlation matrix in SPSS (also known as PASW). Describes the range and strength of associations, as well as positive and negative associations. Also describes the pearson correlation (r), the significance level (p), and the sample size (n). This video podcast shows how you can use Microsoft Excel to calculate the Pearson product-moment correlation coefficient, r. This tutorial will explain in details how to use all the formulas in Excel to get to r, rather than explain the short Excel function of correlation coefficient, r.
Before you can find the correlation coefficient on your calculator, you must turn diagnostics on. After this, you just use the linear regression menu.